This journey is meant to be just that- two individuals who are vastly different are choose to travel together across the country for very different motives. Shirley chooses Tony because he knows he will provide protection. Tony, a man who at the beginning of the film throws glasses used by black men in the trash, accepts the job because it pays well. I would be interested to know how the friendship developed in real time because it seems hard for me to believe it made such a quick turnaround. However, putting reality aside, the film centers on the strides Vallelonga makes in overcoming that racism. The undercurrent is the isolation that Shirley feels as a black man who doesn’t fit in with race: he’s too elite for the black community, and he’s too black for the white community. But they find some comfort in each other. There are some great moments in this film, but there are also moments that miss the mark. There is one scene where they break down on the side of the road next to a field of black workers. The sight of a white man serving a black man stops everyone and the scene is just still. I found myself with tears in my eyes during this scene. There were also other scenes where the fear, the isolation, the hate felt real and I think if director Peter Farrelly (Dumb and Dumber) would have allowed just a bit more stillness, a bit more time for these things to sink in, the movie would have packed a bigger punch. There are jokes and moments that resonate, but there are also jokes that feel like you are laughing at the expense of the racism it’s trying to distance itself from. I don’t think the film was trying to make jokes out of racism or the situations that occur, but I think with you have white directors and writers, it’s naturally going to be a white-washed perspective and subsequently, a watered down and uncomfortable product in some places. I really liked this film and I liked the relationship between the characters. I thought it was charming and although some parts missed the mark, I think it’s important to feel uncomfortable and address that- talk about it- and keep learning, especially in today’s environment. If these two men could overcome this in 1962 during Jim Crow, we certainly can make some progress. Perhaps it starts with the film. 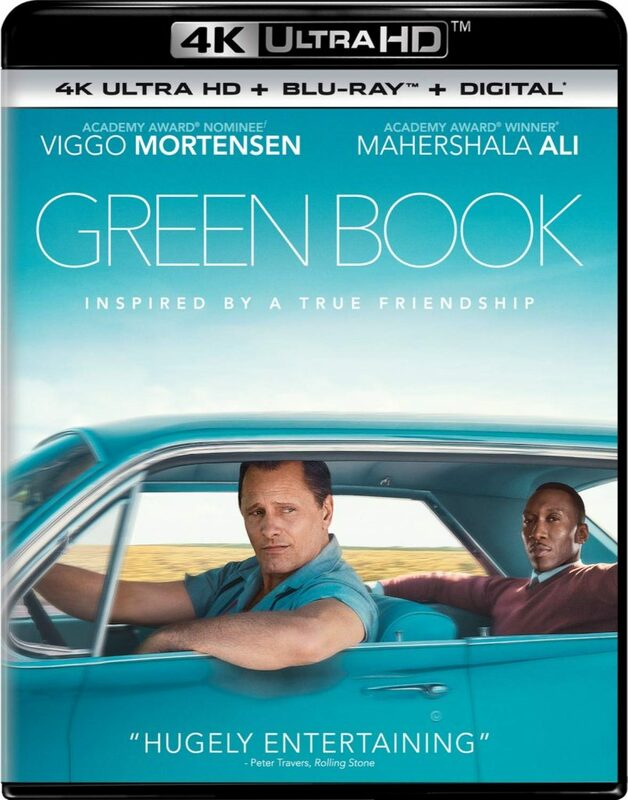 The Video: ‘Green Book‘ comes with a 2160p UHD image in HDR and is presented in 2.00:1 aspect ratio. The 1080p HD release looks great, but with this UHD image, detail and color are enhanced to a degree where you’ll be able to distinguish a difference in facial features and wardrobe textures. Colors in the HDR look beautiful as Tony and Dr. Shirley road trip across the country with stunning sky blues and exuberant green pastures. These bright earthy tones are bold and striking for sure. The classic vehicle colors of the time period also pop well along with the different color browns in various bar or hotel settings. It all looks quite good here and is a noticeable upgrade from the 1080p Blu-ray version. Detail is sharper and more vivid in both closeups and wide angle shots. You’ll be able to see facial pores, wrinkles, beads of sweat, and even individual hairs easier here. 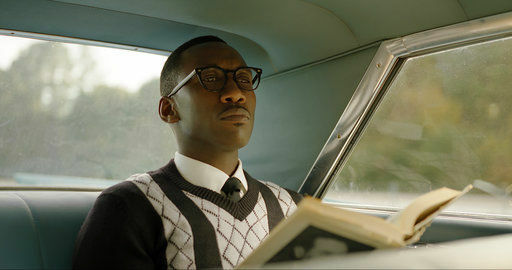 The different high end suits that are worn also reveal the detailed stitching that went into them along with the crispy skin of fried chicken that is eaten in the movie. What a wonderful looking 4K UHD release. Black levels are deep and inky for the most part and the skin tones are always natural here. There are some spots where the white levels burn a little brighter, but I do believe that is for effect and style and not a source issue. There were no problems with banding or aliasing here, making this a fine video presentation. 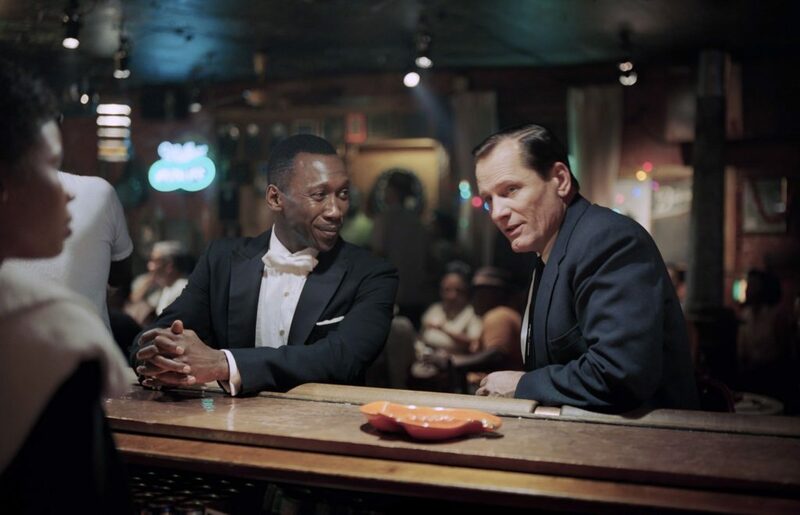 The Audio: ‘Green Book‘ comes with an excellent and elegant Dolby Atmos track that livens up the amazing music that accompanies this film. This isn’t a huge action movie with tons of bullets or explosions by any means, but the atmosphere of each venue and the music sounds magnificent. The opening scene of the movie takes place at the Copacabana where it’s lively and chaotic. People are yelling, talking, and laughing, while the band is on stage and the music flowing, and even a fight breaks out. You can even hear plates and glasses clinging together as the waitstaff is serving the guests. All of these nuanced sounds are robust and loud and provide the perfect amount of balance and layering to this audio mix. Other venues such as ballrooms, concert halls, and even local dive bars have the necessary reverb and ambient noises of patron’s applause to make it sound like you are in the middle of each concert. The music itself is phenomenal where each note of every instrument is heard and precise with the right amount of low end bass to give it that extra mile and sound deep. Overhead speakers catch rain sequences and other ambient noises from time to time and makes each transition seamless. Dialogue is clear and easy to follow along with, and free of any pops, cracks, hiss, or shrills. Virtuoso Performances (HD, 4 Mins.) – A short glimpse at the actors and characters in the film. An Unforgettable Friendship (HD, 5 Mins.) – A few more interviews that talk about the real life friendship between the two men, historical references, character traits and more. Going Beyond the Green Book (HD, 5 Mins.) – An examination on the real Green Book from that point in time. 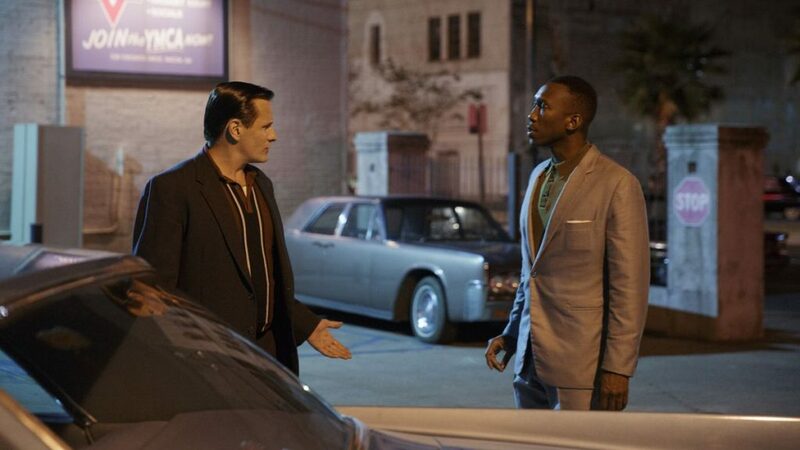 ‘Green Book‘ is a good film about a true-life story that is inspiring, funny, and full of excellent music and characters. The Farrelly Brothers have come a long way from ‘There’s Something About Mary‘ for sure. The 4K UHD with HDR looks great video wise and is a step up from the standard 1080p Blu-ray release, which already looks good as well. The Dolby Atmos track is fantastic as well and well worth your time. The extras are short, but sweet, however there’s not a lot to go on here. Still, this release comes Recommended! This entry was posted on Tuesday, March 19th, 2019 at 11:22 am	and is filed under Film, News. You can follow any responses to this entry through the RSS 2.0 feed. You can skip to the end and leave a response. Pinging is currently not allowed. « ‘Suspiria’ – Blu-ray Review!